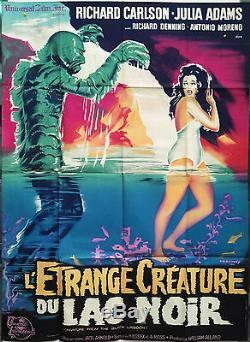 A 1962 Re-release Vintage Theatrical Folded French One-Panel Grande Movie Poster L' ETRANGE CREATURE DU LAC NOIR Creature from the Black Lagoon, the classic 1954 Jack Arnold Universal 3-D (3D; 3-Dimension) science fiction (sci-fi) monster horror thriller Sheer, stark terror grips you in underwater... 3-D"; "Terrifying monster of the ages raging with pent-up passions! With every man his mortal enemy... And a woman's beauty his prey! "; "Centuries of passion pent up in his savage heart! "; "Monster from a million years ago! "; "CLAWING MONSTER FROM A LOST AGE strikes from the Amazon's forbidden depths! 3D" starring Richard Carlson, Julie Adams (billed as "Julia Adams), Richard Denning, Antonio Moreno, Nestor Paiva, Whit Bissell, Ricou Browning (who played the Gill Man underwater), Ben Chapman (who played the Gill Man on land), and Bernie Gozier. Note that the inspiration for this movie began when William Alland (the producer of this movie) was playing an acting role in "Citizen Kane", and he learned of a myth about half-man half-fish creatures in the Amazon. He wrote notes for a story called "The Sea Monster" in 1951, combining the above myth with the "Beauty and the Beast" story. In December 1952, a 59-page treatment called "Black Lagoon" was written by Maurice Zimm and Leo Lieberman wrote a script based on that treatment in early 1953, but Universal turned it down. After this script was written, a new script was written by Arthur Ross and Harry Essex, and that was the script that was used for the movie as filmed, and the last great Universal monster was created! Artist: Constantine Belinsky Size 63" x 45" aprox Condition as shown in pictures. 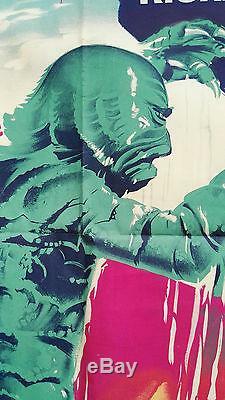 The item "Original Vintage Folded French movie poster CREATURE FROM THE BLACK LAGOON" is in sale since Tuesday, November 29, 2016. This item is in the category "Entertainment Memorabilia\Movie Memorabilia\Posters\Originals-International\1950-59". The seller is "elconocedor2004" and is located in L01.